Valentine’s Day piles on the pressure to find the perfect partner and - with it predicted that 50% of new couples will be finding each other online by 2030 - online dating apps are becoming the routine way to meet your next potential partner. More than ever, this highlights the importance of a perfected online dating profile. Science shows that it takes us less than three seconds to decide if we are initially attracted to someone, so with such limited window to wow, what can we do to ensure we make the best first impression? Aesthetically, teeth are the most important physical attribute, with over half of single individuals deeming a straight gleaming white smile a significantly important attribute in a potential partner. 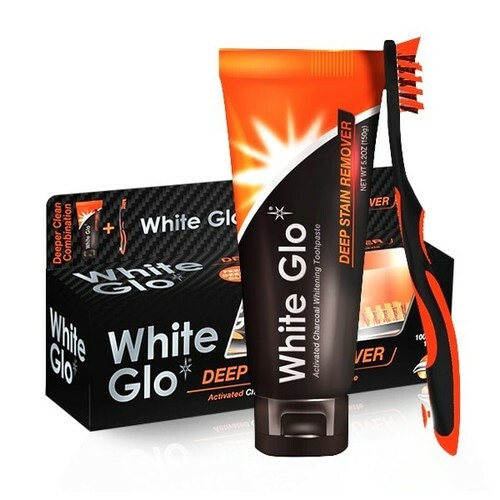 Using a charcoal-based toothpaste such as White Glo’s Charcoal Deep Stain Remover Toothpaste can help to eradicate teeth stains. The highly absorbent charcoal technology traps colour particles, banishing stains and detoxifying the mouth to reveal a gleaming white smile. What’s more, its low- abrasion formula protects cavities making it a safe and suitable treatment for everyday use. Complete your oral hygiene routine by using the free flosser toothbrush and dental flosser toothpicks available in every pack. Perhaps surprisingly, good grammar is also important, with singletons preferring a potential partner who knows how to correctly use apostrophes and structure coherent sentences. Reading through messages thoroughly averts the massive turn-off of shoddy sentences or grim grammar. Even using particular words can decrease your chances of success. Listing attributes such as being ‘happy’, ‘spontaneous’ and ‘trustworthy’ can evoke negative responses from individuals viewing your profile, whereas swapping these for other attributes such as being ‘shy’ can assist you in appearing more desirable. Avoiding cheesy chat-up lines is also a good idea, with the UK’s most pitiful and painful pitch - “Your dad must be a thief because he stole the stars and put them in your eyes” – is one phrase to avoid using. Opting for photographs that show you in action, such as playing a sport or a musical instrument are ways to instantly get more attention, and are good evidence to back up the interests you might be claiming in your bio. This can instantly differentiate you from the 44% of Brits who lie on online dating profiles. Specifically choosing photos that highlight passion and commitment and avoiding intrusive shirtless pictures can all help to build a desirable profile. Most importantly the essence of a dating profile should capture the real ‘you’, as drastically adapting and modifying yourself in order improve online dating success will only tend to generate unsuitable matches. With singletons deeming confidence as one of the most important and attractive attributes in a prospective partner, having self-belief and confidence is the key to successfully navigating the complex world of online dating. Samples are available for press, these include: White Glo Pure and Natural, Professional Choice, Smokers Formula, Charcoal Deep Stain Remover, Diamond Series and Coffee and Tea Remover Formula. This press release was distributed by ResponseSource Press Release Wire on behalf of Kin Communications2 in the following categories: Men's Interest, Leisure & Hobbies, Women's Interest & Beauty, for more information visit https://pressreleasewire.responsesource.com/about.